I woke up to text messages, voicemails, Facebook wall posts and Instagram collages. I felt so loved and it was only 9 a.m. I heard from friends back in New York, friends from high school, college and around town. People I haven’t talked to in months personally reached out to wish me a happy birthday. I felt so special and want to give each and every one of you a holler for making my day so fantastic. Truly, thank you. 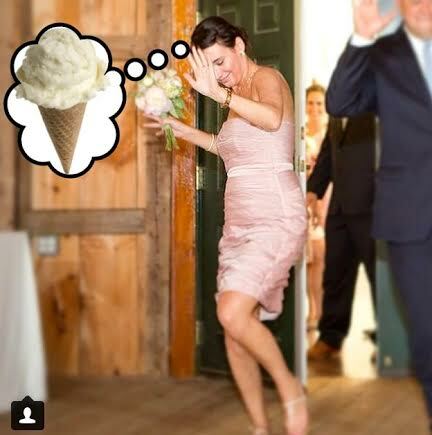 A personal favorite collage with the title, “Someone hand this girl an ice cream cone!” Thanks, Missie! As part of a present and because I have the worlds best parents, my Mom offered to make my birthday cake. I told her I’d find the recipe and we would bake it together. My mind was set on salted caramel and when I found a recipe that included nutella as well, I was sold. 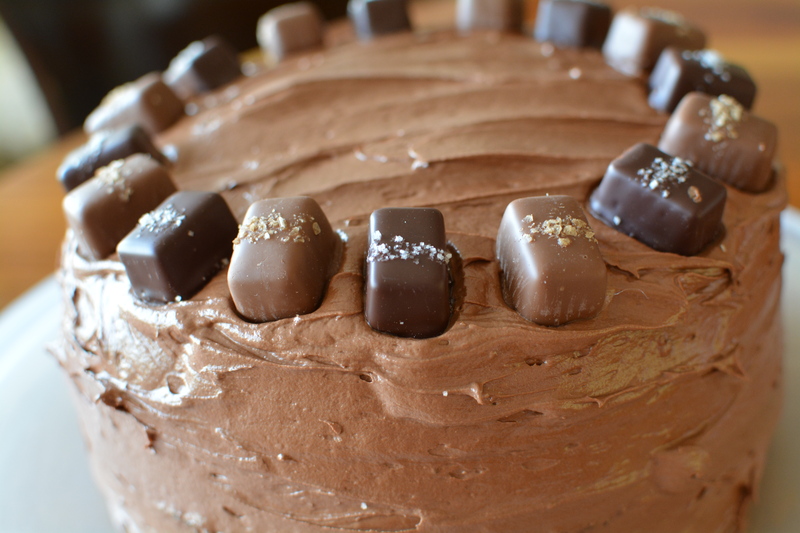 What’s so awesome about this recipe is how interchangeable it can be – the cake was rich, moist and full of that chocolate flavor we all know and love. Next time I’d make the cake with a whipped vanilla bean frosting. Mmmm. Drooling as I type this. Yes. That will have to happen sometime soon. The frosting, with hints of nutella would be delicious on cupcakes. However, when both were combined with salted caramel smothered on each layer…well, the magic happened. 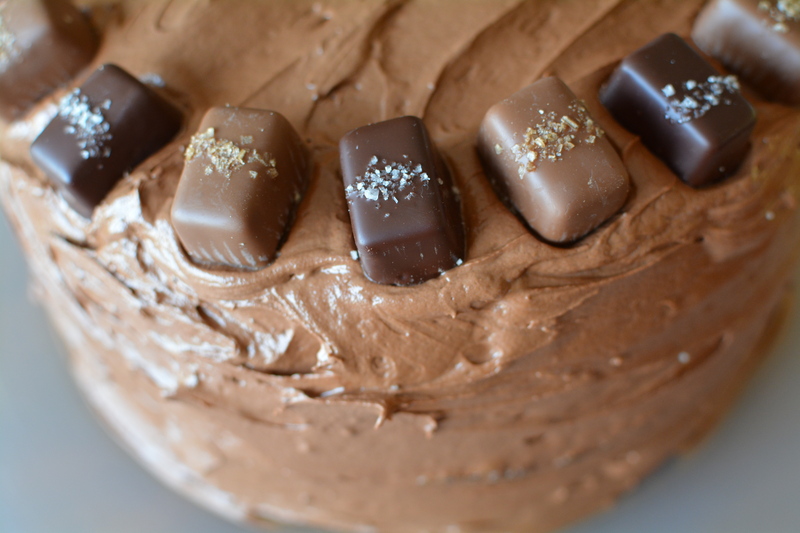 Before frosted: each layer combines frosting and salted caramel. The recipe called for Ferrero Rocher candies, but since I couldn’t find them at the store, I picked up salted caramels instead. Turns out, it was one of the better choices I’ve made so far in my 27th year. I served the cake to some of my best friends. Candles were lit, songs were sung and plates were cleaned (phew!). If you’re looking for a sweet birthday treat with somethin’ a little extra, I can’t imagine finding a better cake. 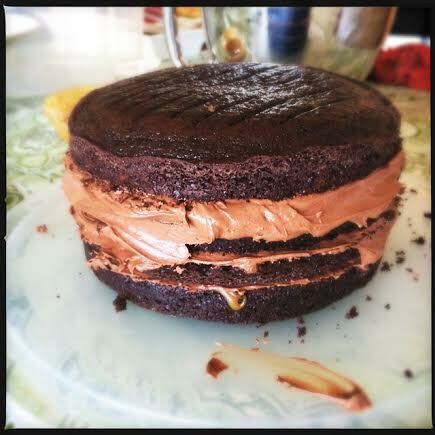 And if you liked salted caramel / nutella / chocolate, this is definitely the cake for you. *The original recipe says that if you decide not to torte your cake (cut the layers in half) you can use half of this recipe. 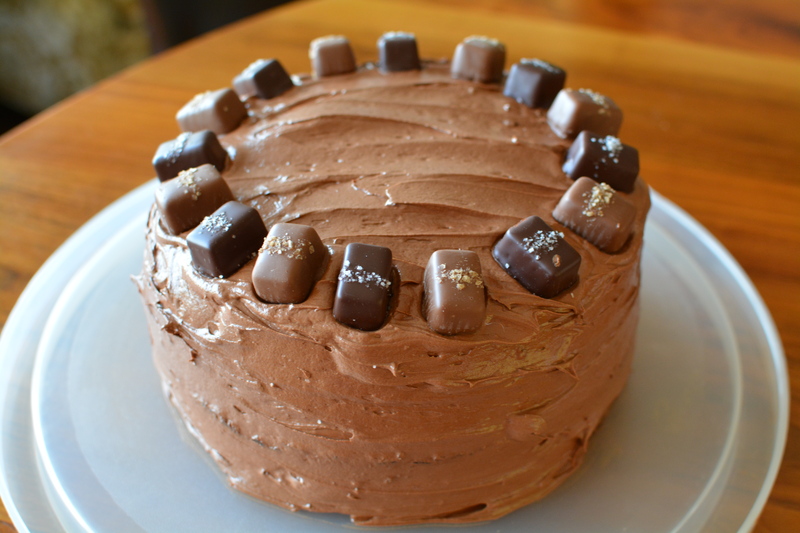 However, we made the whole batch and had enough leftovers for an entire cake. I’d suggest halving the recipe and if you need more, it’s easy enough to whip up some more!